The Comoro Islands or Comoros (Shikomori Komori; Arabic: جزر القمر‎, Juzur al-Qumur / Qamar; French Les Comores) form an archipelago of volcanic islands situated in the Indian Ocean off the south-east coast of Africa, to the east of Mozambique and north-west of Madagascar and the French region of Mayotte. 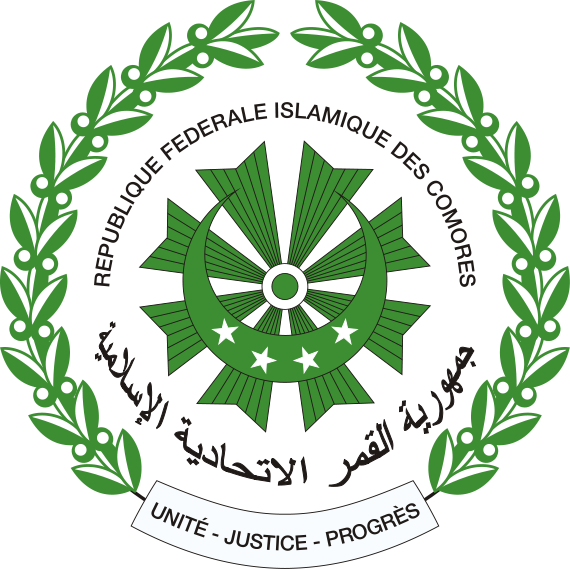 Officially known as the Union of the Comoros (Comorian: Udzima wa Komori, French: Union des Comores, Arabic: الاتحاد القمري‎ al-Ittiḥād al-Qumurī / Qamarī). The islet of Banc du Geyser and the Glorioso Islands are part of the archipelago. The islands are politically divided between Union of the Comoros (pop. 795,601) and two territories of France : the region of Mayotte (pop. 212,645) and the Glorioso Islands, a part of the Scattered Islands in the Indian Ocean, the 5th district of the French Southern and Antarctic Lands. The capital and largest city in Comoros is Moroni (Dzaoudzi 1887-1962; Chingoni 1841-1887). The religion of the majority of the population is Sunni Islam. At 1,660 km2 (640 sq mi), excluding the contested island of Mayotte, the Comoros is the third-smallest African nation by area. As a nation formed at a crossroads of different civilisations, the archipelago is noted for its diverse culture and history. The archipelago was first inhabited by Bantu speakers who came from East Africa, supplemented by Arab and Austronesian immigration. The sovereign state is an archipelago consisting of three major islands and numerous smaller islands, all in the volcanic Comoro Islands. The major islands are commonly known by their French names: northwestern-most Grande Comore (Ngazidja); Mohéli (Mwali); and Anjouan (Nzwani). In addition, the country has a claim on a fourth major island, southeastern-most Mayotte (Maore), though Mayotte voted against independence from France in 1974, has never been administered by an independent Comoros government, and continues to be administered by France (currently as an overseas department). France has vetoed United Nations Security Council resolutions that would affirm Comorian sovereignty over the island. In addition, Mayotte became an overseas department and a region of France in 2011 following a referendum passed overwhelmingly. Territorial Disputes: Claims French-administered Mayotte and challenges France's and Madagascar's claims to Banc du Geyser, a drying reef in the Mozambique Channel. In May 2008, African Union forces were called in to assist the Comoros military recapture Anjouan Island from rebels who seized it in 2001. 1503 Comoros discovered by Portuguese explorers. 05 Sep 1887 Renamed Protectorate of the Comoros. 09 Apr 1908 Comoros a dependent territory of Madagascar. 27 Oct 1946 Comoros overseas territory of France. 22 Dec 1961 Autonomy (State of Comoros). 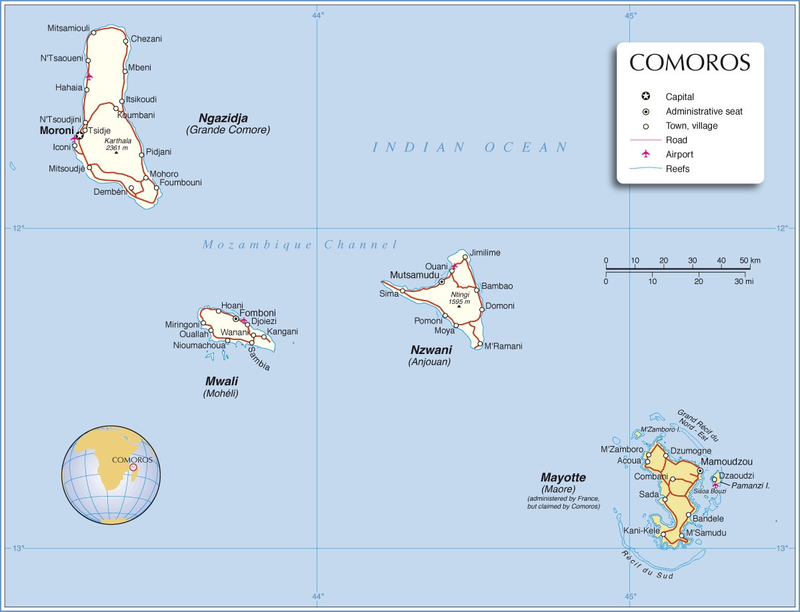 06 Jul 1975 Independence (State of Comoros)(excluding Mayotte). 31 Dec 1975 France recognizes Comoros independence. 24 May 1978 Federal and Islamic Republic of Comoros. 11 Aug 1997 - 1998 Secession of Mohéli (Mwali)(not internationally recognized). Grande Comore (also known as Ngazidja): the largest island of the Union of the Comoros, with its capital Moroni. Anjouan (also known as Ndzuwani or Nzwani): part of the Union of the Comoros. Mohéli (also known as Mwali): part of the Union of the Comoros. Grande-Terre (also known as Maore or Mahori): part of the French overseas department of Mayotte, with its capital Mamoudzou. Petite-Terre (also known as Pamanzi): Mayotte's second-largest island with the Dzaoudzi–Pamandzi International Airport. The Glorioso Islands, comprising Grande Glorieuse, Île du Lys and eight small rock islets, were administratively attached to the archipelago before 1975, and, geologically speaking, form a part of the archipelago. These Islands are administrated by France. Banc Vailheu, or Raya, a submerged volcano located 20 km west of Grand Comoro. Banc du Geyser (also Banc du Geysir), a reef measuring 8 by 5 km in area, situated 130 km North-East of Grande-Terre. It is controlled by France. Banc du Geyser is a mostly submerged reef in the Mozambique Channel's northeastern part, 125 km (78 mi) northeast from Mayotte, 112 km (70 mi) southwest of the Glorioso Islands, and 200 km (124 mi) off the northwestern coast of Madagascar. Banc du Leven, a former island between Madagascar and Grande-Terre which is now submerged. An island in the Comoros, about 340 miles (545 km.) west of the northern tip of Madagascar, and 280 miles (450 km.) east of northern Mozambique. Capital: Mutsamudu (formerly Domoni). 21 Apr 1886 French protectorate of Comoros. 25 Jul 1912 Annexed by France. 26 Oct 1997 Referendum endorses independence. 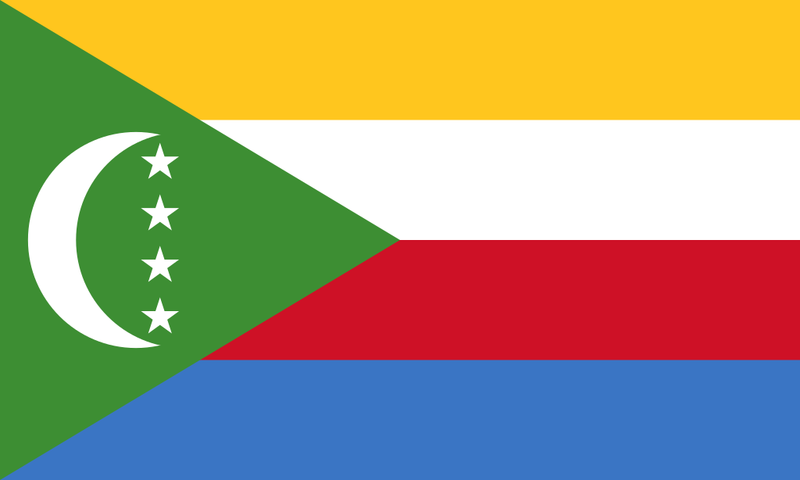 Anjouan as an autonomous part of the Union of Comoros. 10 Mar 2002 - Feb 2012 Constitution. He was National Coordinator to 22 Aug 1999. Halidi Charif (Military)........................10 Aug 2001 - 25 Aug 2001 with.. He was premier chef d'autorité de l'île, in rebellion. He was overthrown by forces loyal to Bacar on 10 May. Peace talks were held between the Comorian and Anjouan governments whereby they agreed to hold free elections in which Mohamed Bacar would stand. Although the Union government delayed the election, citing alleged irregularities and intimidation. Bacar unilaterally printed ballots and held an illegal election in June. The result, due to electoral fraud, was an overwhelming victory of 90 percent. In July 2007, Bacar once again declared the island of Anjouan to be independent of the Comoros. In February 2008, the Comoros rejected the African Union's extended sanctions against Anjouan and instead opted for a military solution. In early March, the Comoros armed forces and around 400 international reinforcements from the African Union assembled on the island of Mohéli. Hostilities began on March 11, when Comorian forces staged an armed incursion on the island. Mohamed Bacar managed to escape to Mayotte by 26 March to seek political asylum. He was subsequently held in custody there by the French administration and brought to the island of Réunion, where he was charged for entering French territory illegally and possession of weapons. On 15 May, France rejected Bacar's request for asylum but the French refugee office ruled that the ousted leader could not be extradited to Comoros because of the risk of persecution. France's State Secretary for Overseas, Yves Jégo, said France would support the Comorian government's efforts. "We will continue to act in consultation with the Comoros so that the law can be applied and Col Bacar can be tried". On June 24, 2008, the Saint-Denis Court of Appeal ruled against extraditing Bacar to the Comoros. With all his appeals exhausted, Bacar, his brother, and two of his men were expelled from Réunion on the morning of July 19. They were taken to Cotonou, Benin, on a French government flight; the Beninese government had agreed to allow Bacar to stay in Benin. Bacar said that on this occasion that he intended to stay there for as long as his presence was allowed, and he expressed a desire to "reflect on our past errors". Comorian government spokesman Abdourahim Said Bakar said that the government was "disappointed" by the expulsion of Bacar to Benin, reiterating the government's position that he should face trial in the Comoros or before an international court. He is under arrest from 21 Oct 2018. Comoros President, Azali Assoumani appoints Abdallah Mohamed as administrator of Anjouan, Governor Abdou Salami Abdou being in detention since 25 October 2018. The result of election on 24 March 2019, Anissi Chamsidine 67.9%, Nassimou Ahamadi 20.2%; turnout 67.4%. One of the Comoro Islands group, 40 miles (65 km.) southeast of Gran Comoro and an equal distance west of Anjouan. It was governed 1997-2002 by a secessionist movement. Capital: Fomboni. separate sultanate; previously Mwali was subject to Anjouan. 26 Apr 1886 French protectorate. dependent of the Residents of Anjouan. 1912 Sultanate abolished by colonial authority, part of Comoros. He was earlier known as Ramanetaka. She was known as Raketaka Jombe Sudy and from 1851, Jumbe Fatima bint Abderremane. Salima Machada never assumed office. When Mahmudu resigned in 1897, Mohéli was governed solely by French Residents at Anjouan, until 1912, when all the islands were annexed by France as Mayotte and Dependencies, and then subordinated to Madagascar two years later. He represented the resident of Anjouan. Constitution written in French: 10 March 2002. Vacant: 19 May 2007 - 22 May 2007. He takes leave as required by the constitution due to his candidacy in the coming election. The result of election on 24 March 2019, Said Baco Attoumane 36.3%, incumbent Mohamed Said Fazul 35.1%, Djabir Abdou 11.8%; turnout 61.1%. First round; runoffs to be held on 21 April 2019. Grande Comore (Swahili: Ngazidja) is an island in the Indian Ocean off the coast of Africa. Largest and westernmost of the Comoros Island group, about 440 miles (700 km.) west of the northern tip of Madagascar and roughly 200 miles (320 km.) east of northern Mozambique. Most of its population is of the Comorian ethnic group. The island's capital is Moroni, which is also the national capital. The island is made up of two shield volcanoes, with Mount Karthala being the country's highest point at 2,361 m (7,746 ft) above sea level. According to the 2009 revision of the constitution of 2002, it is governed by an elected Governor, as are the other islands, with the federal government being much reduced in power. The name Ngazidja is sometimes seen in the now nonstandard form Njazidja. retaining their titles) into the State of Ngazidja. 24 Jun 1886 Ngazidja a French protectorate. 06 Jan 1892 Local sultanates suppressed. 1911 Annexed by France (officially ratified 23 Feb 1914). 06 Jul 1975 Part of independent Comoros. (Autonomous Island of Grand Comore). Before the coming of the Europeans, Gran Comoro was partitioned among 11 small local Sultanates (Bajini, Bambao, Hamahame, Hamamvu, Hambu, Itsandra, La Dombe, Mbaku, Mbude, Mitsamihuli, Washili); generally, one of these held the style of Tibe, Paramount Ruler. Note: Some rulers of Bambao and of Itsandra acquired the paramount-ruler style tibe. These are marked (tibe #), where # indicates the order in which they held it. Ju Mamba Oma wa Mla Nau and Mwambatsi ruled together. Bamba Oma, Suja Oma wa Tambwe and Shekani, all three ruled together. Fumu Oma and Oma wa Dari ruled together. He was Sultan of Bambao and Itsandra. He was born in c.1793 and died in 1875. Mohamed bin Ahmed (2nd time)....................................1874 ? He was born in c.1856 and died in 1916. Hamahame - Subordinated to Itsandra. list of rulers are unknown. Madi Jimbwa wa Tangwe and Dari wa Mla Nau ruled together. Mrunda Mijo and Fey Mwando wa Tambwe ruled together. Abudu bin Mohamed bin Sultani and Bamba Oma wa Oma ruled together. Jumbe Fumu Mfaume wa Domba and Kori Dazi ruled together. Jumbe Fumu Mfaume wa Domba and Tambavu wa Jumbe Fumu ruled together. Suja Fumu Mbamba and Mba Fumu wa Jumbe Fumu ruled together. Msa Fumu wa Tambwe and Jumbe Fumu wa Jumbe Mfumu ruled together. Abdallah bin Ahmed and Mbandhi wa Bwana Haji ruled together. Washili (Oichili) - Subordinated to Itsandra. Tambwe Msa Fumu and Tambwe wa Habadi ruled together. He was born in 1735 and died in 1815. Mba Fumu wa Suja Fumu Bamba and Shekhe Salim ruled together. In 1841 the island of Mayotte was made a French colony. The French, the British and the Germans wanted to exercise power and trade on the Commores. In 1886, the island of Ngazidja or (Grande Comore in French) comprised nine sultanates. Saidi Ali bin Saidi Omar, the ruler of Bambao unifies the island (the local rulers retaining their titles) into the State of Ngazidja. But on 24 June 1886, the Sultan (paramount ruler and Sultan) of Bambao usurped the other sultanates and signed a treaty with French, granting France rights over the entire island. Ndzuwani (Anjouan), and Mwali sultanate (Mohéli island in French) became French protectorates the same year and a French résident was posted to each of the three islands. In 1892 Sultan Said Ali bin Said Omar was banished to Réunion. He was in exile from 19 Sep 1893 to Diégo-Suarez and then from 1897 in Réunion. On 09 April 1908, France declared the Comoros a single territory (Mayotte and dependencies) and attached it to the colony of Madagascar. Said Ali bin Said Omar went to court. The French judges awarded him a compensation for his losses. Saidi Ali ibn Saidi Omar died on 10 February 1916 in Tamatave (Toamasina) on Madagascar. His son, Crown prince Said Houssein joined the French Foreign Legion on 04 August 1916. He was known as "the White Sultan". The result of election on 24 March 2019, Mhoudine Sitti Farouata 38.5%, Aboudou Soefou 23.1%, Youssouf Mohamed Boina 17.2%; turnout 55.5%. Currency: Franc = 100 centimes (Santīmāt). 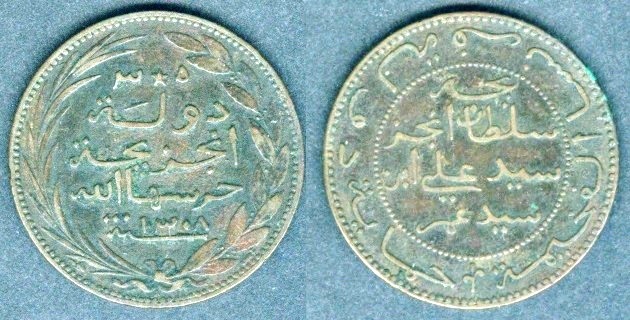 The coins were issued in AH 1308 (1891) for Njazidja (Grande Comore) by Sultan Saidi Ali bin Saidi Omar. KM#1.1 5 centimes. Year: AH 1308 (1891). Weight: 4.89g [5.00g]. Metal: Bronze. Diameter: 25.00 mm. Edge: Plain. Alignment: Coin. Mint: Monnaie de Paris (mintmark: Fasces). Obverse: "٥" (5) written at the top right side, Star at the center top position and "س" (S) written at the top left side. "دولة نجزيجة" (State of Ngazidja) written as first two lines. "حرسها اللة" (God guard it) written as third line in Arabic. "سنة" (Year) with Date "١٣٠٨" (1308) written at the bottom. Wreath surrounds the legends and Date with knot at the bottom. Reverse: "يجة" (wage) written in Arabic at the top within the center beaded circle. "سلطان انجز سيد علي ابن سيد عمر" (Sultan of Ngazidja Said Ali ibn Said Omar) written in Arabic as last three line within the center beaded / dotted circle. "حماية دولة فرنسا الفخيمة" (The protection of the French state) written in Arabic starting at 6 o'clock in circular form outside the beaded center circle. A stylized lily at the bottom. Mintmark "Fasces" at 5 o'clock near the border. Mintage: 100,200. Minted Years: One year type with two different mint marks. Engraver: Henri Auguste Jules Patey. Henri Auguste Jules Patey (09 September 1855, Paris – June 1930, Paris) was a French sculptor, medallist and coin engraver. Patey studied sculpture with Henri Chapu and engraving and medal making with Jules-Clément Chaplain. He was admitted to the École nationale supérieure des Beaux-Arts in 1873. In 1875, he won the second Prix de Rome for medal engraving and in 1881 he won the first Grand prix de Rome, also for medal engraving. He won further prizes in 1886 (third), 1887 (second) and 1894 (first). At the Universal Exhibition of 1889 he won a bronze medal. He produced many portrait medals, not only of clients, but also of relatives and friends. He also authored decorations and patterns. He succeeded Jean Lagrange as chief engraver of the Paris mint in 1896, a position he held until his death. In 1898, he became a knight of the Légion d'honneur. He used a torch as his privy mark. In this position, Patey designed the France 25 Centimes 1903-1904 in Nickel. This piece was generally rejected. It was the first Nickel coin in France. 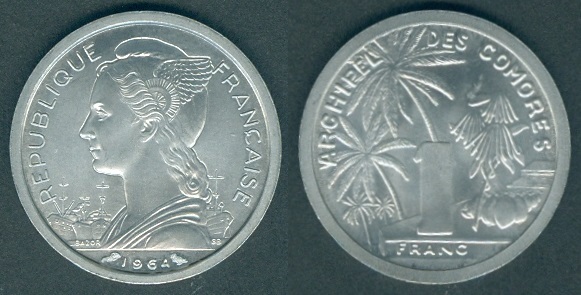 The white metal was taken for silver and the coin confused with the 1 franc, in spite of a completely different design. Coin of 25 centimes with a different design and shape (22-sided) dated 1904-1908 were not accepted either. He did not design any other coins for France after this double disappointments. Copper-nickel coins succeeded only in 1914, when holed coins were produced. However, he designed coins for French colonial and foreign coins: Cameroon (1924-1926), French Indo China 5 centimes (1923-1943), Guadeloupe (1903, 1921), Kingdom of Serbia, Croatia and Slovenia (1925), Thailand: 1 baht 1908, Togo (1924-1926) and possibly coins for the Comoros, Syria and Lebanon struck at the Paris mint. He was a member of the Académie des Beaux-Arts from 1913. Henri-Auguste Patey died in 1930. KM#1.2 5 centimes. Year: AH 1308 (1891). Weight: 4.90g [5.00g]. Metal: Bronze. Diameter: 25.00 mm. Edge: Plain. Alignment: Coin. Mint: Monnaie de Paris (mintmark: Torch). Mintage: 200,000. Note: Same as above coin but mintmark "Torch" at 5 o'clock near the border on the Obverse side. KM#2.2 10 centimes. Year: AH 1308 (1891). Weight: 9.53g [10.00g]. Metal: Bronze. Diameter: 30.00 mm. Edge: Plain. Alignment: Coin. Mint: Monnaie de Paris (mintmark: Torch). 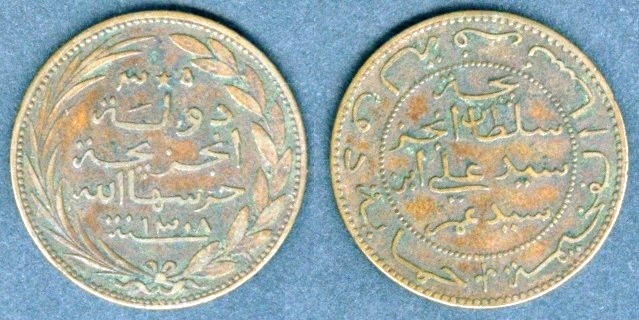 Obverse: "١٠" (10) written at the top right side, Star at the center top position and "س" (S) written at the top left side. "دولة نجزيجة" (State of Ngazidja) written as first two lines. "حرسها اللة" (God guard it) written as third line in Arabic. "سنة" (Year) with Date "١٣٠٨" (1308) written at the bottom. Wreath surrounds the legends and Date with knot at the bottom. Reverse: "يجة" (wage) written in Arabic at the top within the center beaded circle. "سلطان انجز سيد علي ابن سيد عمر" (Sultan of Ngazidja Said Ali ibn Said Omar) written in Arabic as last three line within the center beaded / dotted circle. "حماية دولة فرنسا الفخيمة" (The protection of the French state) written in Arabic starting at 6 o'clock in circular form outside the beaded center circle. A stylized lily at the bottom. Mintmark "Torch" at 5 o'clock near the border. Mintage: 100,000. Minted Years: One year type with two different mint marks. Engraver: Henri Auguste Jules Patey. Note: KM#2.1 10 centimes exists with mintmark: Fasces with mintage: 50,200. KM# 3 / Lec# 10 / Schön# 3 / Dav# 9 5 Francs AH 1308 (1891). 0.900 Silver. Weight: 25.00 g. Diameter: 37.25 mm. Mintage: 2,050. On 09 April 1908, France declared the Comoros a single territory (Mayotte and dependencies) and attached it to the colony of Madagascar. On 25 July 1912, the protectorate was abolished and Ngazidja, along with the three other islands, was annexed by France and the entire archipelago was constituted as a province of Madagascar. This was ratified on 23 February 1914. He was acting to 11 Feb 1958. Currency: 1925-1945: Madagascar Franc (MGG). 1945-1975: Madagascar-Comores CFA Franc (XMCF). The French franc became the currency of Comoros after the islands became a French protectorate in 1886. 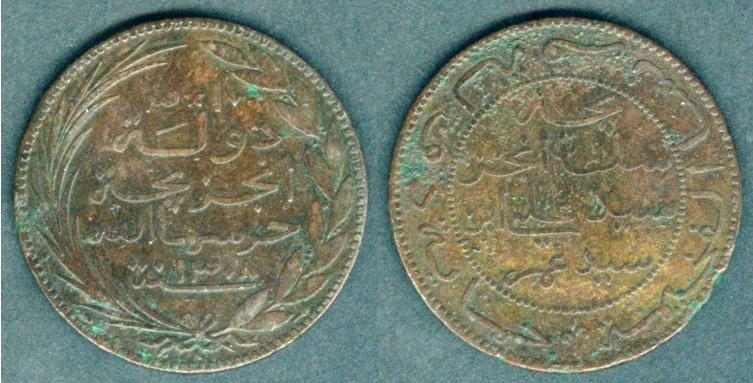 In 1891, Sultan Said Ali bin Said Omar of Grande Comore, Ngazidja issued coins denominated in centimes and francs which circulated alongside French currency. In 1912, the Comoros became a province of Madagascar, which was a French possession. French banknotes and coins circulated in the colony. Apart from an emergency issue of small change notes in 1920, the French currency circulated alone until 1925. On 01 July 1925, the French government formed an agreement with the Banque de Paris et des Pays-Bas to create the Banque de Madagascar, headquartered in Paris, and granted it a private monopoly to issue currency for the colony of Madagascar. 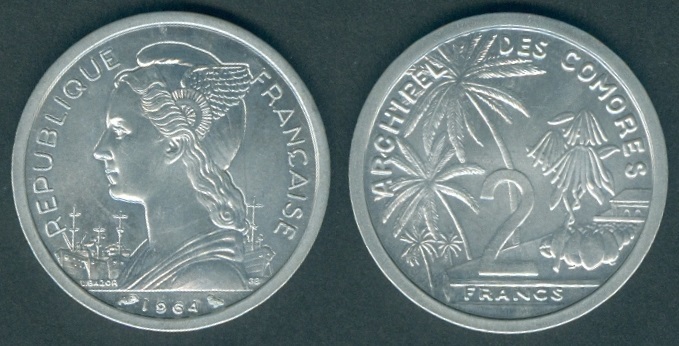 The Malagasy franc (French: franc malgache) was equivalent to the French franc and French coins continued to circulate as Madagascar had no coins of its own until 1943. When the Comoros became a separate French territory in 1945, the name of the issuing bank was changed to the Banque de Madagascar et des Comores (still headquartered in Paris). A branch office opened in Comoros in 1953. While the banknotes were changed to reflect the new status of Comoros, the coins were not changed and bore only the name Madagascar. On 26 December 1945, the Madagascar-Comores CFA franc (XMCF) was established to replace the Madagascar franc and its value was fixed at 1.7 French francs. Old Madagascar coins and banknotes continued to circulate as this new currency. On 17 October 1948, the CFA franc was revalued to 2 French francs. In 1950, the French government took over majority ownership of the Banque de Madagascar et des Comores. On 01 January 1960, the French franc was revalued, with 100 old francs becoming 1 new franc. (Décret n°59-1450 du 22 décembre 1959) The new exchange rate was 1 Madagascar-Comores CFA franc = 0.02 French francs (50 Madagascar-Comores CFA francs = 1 French franc). On 26 June 1960, Madagascar gained independence from France, and the Institut d'Émission Malgache (headquartered in Antananarivo) was created to issue currency only for Madagascar. Madagascar left the CFA zone effective 01 July 1973. KM#4 / Schön#4 Franc. Year: 1964. Weight: 1.28g [1.30g]. Metal: Aluminum. Diameter: 23.00 mm. Edge: Plain. Alignment: Coin. Mint: Monnaie de Paris (mintmark: owl). Note: EASSI (pattern) issue exists as KM#E1 with mintage: 1,700. Comoros becomes independent from France on 06 July 1975. He was President of the Government to 07 Jul 1975, then Head of State. He was chairman National Council of the Revolution to 10 Aug 1975, then chairman National Executive Council. He was Head of State to 28 Oct 1977. He was chairman Politico-Military Directorate. On 24 May 1978, State of Comoros becomes Federal and Islamic Republic of Comoros. They were both co-chairmen to 22 Jul 1978 of Politico-Military Directorate. He was chairman Directorate to 25 Oct 1978. He was acting to 20 Mar 1990. He was coordinator Transitional Military Committee. Chief of Staff of the National Development Army to 06 May 1999, then Head of State. On 23 December 2001, Federal and Islamic Republic of Comoros becomes Union of the Comoros. Azali Assoumani takes leave as required by the constitution due to his candidacy in the coming presidential election, and Moustadroine Abdou becomes acting president. In presidential elections on 24 March 2019, incumbent Azali Assoumani wins 59.1% of the vote, Ahamada Mahamoudou 15.7%, and Mouigni Baraka Said Soilihi 5.5%. Turnout is 53.8%. Results of gubernatorial elections (first round; runoffs was to be held on 21 April 2019). On 02 April 2019, President Azali Assoumani resumes office following the proclamation of the official results of the presidential election. Since 26 May 2016, he has served as the Vice-President of the Comoros for Agriculture, Fishing, Environment, Spatial Planning and Urbanism. On 01 January 1975, Banque de Madagascar et des Comores was replaced as Institut d'Emission des Comores with same exchange rate: 50 Comores CFA francs = 1 French franc. On 23 November 1979, the government of Comoros signed the Accord de coopération monétaire entre la République Française et la République fédérale islamique des Comores, a monetary cooperation agreement with France, making Comoros part of the franc zone (but not part of the CFA franc zone). This agreement provided for the establishment of a system of fixed parity between the French franc and the Comorian franc and free convertibility between the two currencies, guaranteed by the Comorian central bank's opening of an operations account (compte d'operation) at the French Treasury (Trésor public) to handle all exchange transactions. Sixty-five percent of the foreign exchange reserves of Comoros are held in euros in this account. This account is similar to overnight deposits with the French Treasury: it may bear interest and may, in special circumstances, post a negative balance. However, to prevent this account from showing a lasting overdraft, a number of preventative measures have been set up. 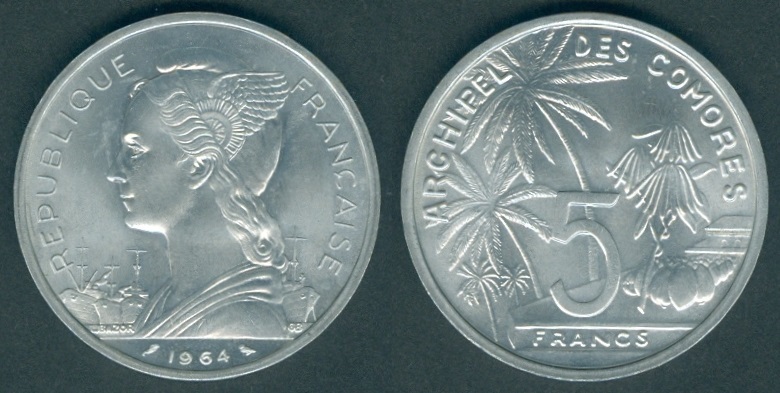 Until 1994, the Comorian franc was pegged to the French franc at the rate of 50 Comorian francs to 1 French franc. This was changed on January 12, 1994, when the currency was devalued in concert with the CFA franc devaluation. however, the Comorian franc was devalued 33⅓% to a new rate of 75 Comorian francs for 1 French franc, while the CFA franc's new rate was 100 CFA francs to 1 French franc. With the creation of the euro on 01 January 1999, the Comorian franc was pegged, at its prevailing rate, to the new currency. Pegged with euro = 491.96775 Comorian francs. 10 apsar. Year: 2011. Weight: 33.65g [33.94g ± 0.31g]. Metal: 0.925 Silver. Diameter: 39.00 mm. Edge: Reeded. Alignment: Medal. Mint: Saint Petersburg Mint Goznak (RF). Obverse: “10 ҧСАРК” (10 APSARS) written on the top. Emblem in the center with “Аҧсны Абанк” (The Bank of Abkhazia) in Abkhazian language written below it. On the right part of the coin, near the border, it has a small square having the logotype and mint trademark in the first line, indication of metal sign "Ag-925" in accordance with the D. I .Mendeleyev Periodic System of Elements and the fineness in the second line and "33.65g" on the third line. Date imposed at the bottom with “Аҧсны Абанк” written several times in five lines on the rough surface in the background. Reverse: 8 stars with "VIII World Domino Championship 10-2011" written around Domino shaped sail boat in the center. Colored waving Abkhazia flag on top of the boat. "Апсны" (Abkhazia) written in Abkhazian language at the bottom. Mintage: probably 1,000 (estimated). Minted Years: One year type. Issued: 12 Sep 2011. Designer: Japua B.R.